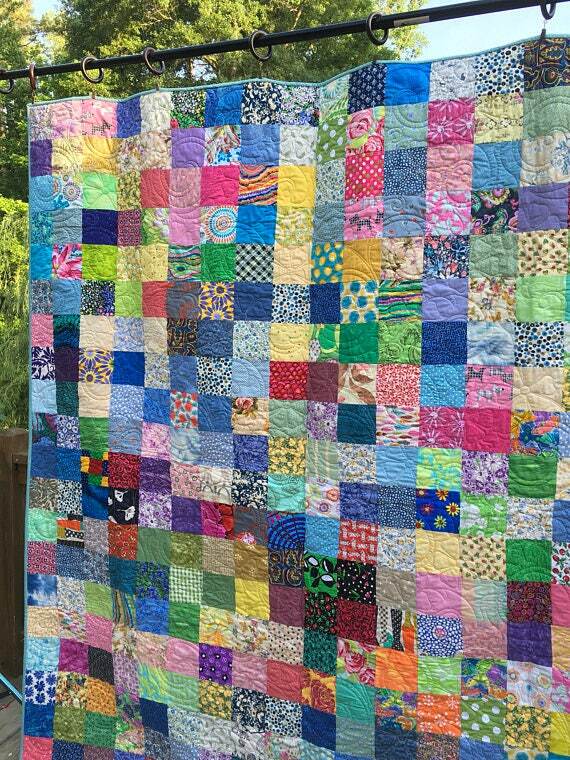 Beautiful quilt will make a lovely birthday present, an anniversary present , or treat yourself! Quilt is made of 4 inch squares of quality new unwashed cotton fabric. The batting is 100% cotton. I professionally quilted it in a flower swirl pattern. The backing fabric is a Denyse Schmidt's plaid fabric. The binding is a coordinating solid and has been machine sewn. Quilt measures 74" X 80". Quilt can be machine washed Gentle cycle and Tumble dry on Low. Quilt will get softer with each washing.